When your kids join Cub Scouts for the first time, there are lots of things that you as a new Cub Scout parent need to figure out. One of the most important is to get their unform ready for the first meeting. If your Scout Shop is like mine, the employees are super helpful when you go in to buy your child’s uniform. They’ll show you which badges and patches you need to get started. 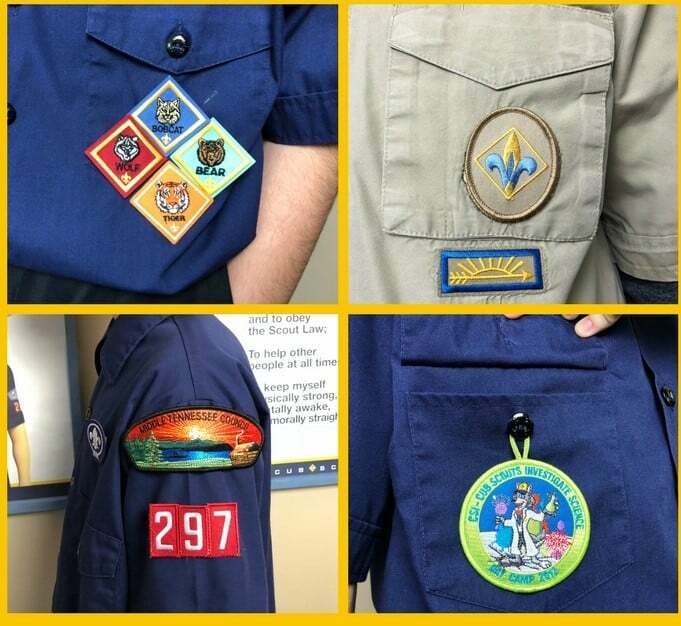 When you get home with the uniform and a bag of Cub Scout patches, your first thought is, “where do these things go?” That’s why my parents’ guide to Cub Scout patch placement is the most visited article on my blog. But you do have several options of how to attach Cub Scout patches onto the uniform. My new favorite option is listed last. Many people use Badge Magic. In fact, that’s what I used for my older son’s first uniform. It worked pretty well for the first couple of years. But by the time my son was a Bear, the edges started peeling up. There are some people who will sew patches on for you. Of course, this option assumes that you’ve planned ahead and it isn’t the day before your meeting. Not that I would know anything about that. A woman I met at Cub Scout day camp sews them on for $1 a patch. She’s really doing it as a service for the Scouts because she donates the money she makes. Another person I used charged $5 per patch. I was in a time crunch and couldn’t take it anywhere else, so I paid that. I do think that’s pretty expensive, and I didn’t use her again. With all these options, I usually hand sew the patches. But that option isn’t without its negatives too. The thread would tangle up. Needles would almost break as I tried to push them through the thick edge of the patch. Look at that hot mess of patches from our early Cub Scout days! 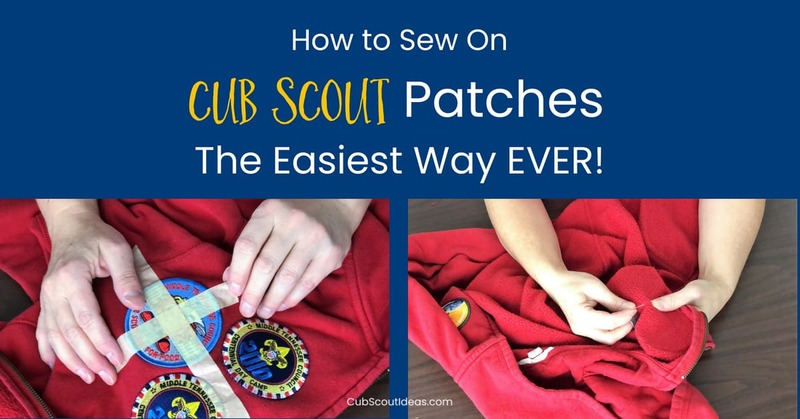 There had to be a better and easier way to sew on those Cub Scout patches! And I found it on Clarke Green’s site, Scoutmaster CG! He writes and podcasts primarily about Boy Scouts, but he has resources that are applicable for Cub Scouts too. In Clarke’s method, you don’t push the needle all the way through the edge of the patch. Instead, the needle just goes through the threads on the back of the patch. I had to read through Clarke’s description a few times before I could visualize it in my head. But when it clicked, I realized that this has to be the easiest way to hand sew patches and badges on a Cub Scout uniform! I couldn’t wait to try it out! It was as easy as I thought it would be. You can see the technique in action by watching this video. Bonus tip: If your pack number is more than one digit, sew the patches together first then sew the one big patch on. So much easier than sewing 2 or 3 individual patches on. Let me know what you think about this method! P.S. You can learn about temporary Cub Scout patches here. I hand see them all on. I use a transparent thread. It’s really not that difficult. Hey that Council patch looks real familiar. I sat 2 weekends ago sewing all the patches onto a new tan shirt because little bit got big and outgrew his. It took hours. I wish I had seen this earlier. At least now I know this for the new Patrol Leader patch and Rank patch I have to do tomorrow night. Might be a good time for these 2 to learn to sew. The trick I learned 10 years ago when my oldest of three sons started cub scouts was to STAPLE the patches onto the uniform (yes, you read that right, staple😅) to keep them straight while sewing and then use clear thread to sew them on so you don’t see the imperfections. It has worked perfectly for ten years and three boys!